Breakfast was horrible today, for more than one reason. The food today was just not great. Yesterday’s wasn’t outstanding but it was decent enough. Today it just wasn’t very good. The second reason was no sooner had I sat down to eat when I got an email that my dad had what the doctors think is a mild heart attack last night. That’s not something you want to see at any time, but especially when you’re so far away, and can’t be of any help at all. I called his wife to get the details and see how things are, what’s next etc. It sounds relatively minor but there still might be surgery. As of writing this, he will be transferred to a hospital near me (vs. where he is now which is 2+ hours away from home). I’ll be happy he’s close so I can be there. After talking to family I decided to bail on breakfast here and went for a walk to pick up something to eat at Starbucks instead. Ugh. The big Microsoft Keynote session was this morning for all of the user groups. Unfortunately there was no space at the convention center large enough to hold everyone so approximately 4,000 people were in the “North” hall where the live presentation was and the remaining 3,000 or so were in the “South” hall watching on some kind of simulcast. I had met Fawad Khan yesterday at the Microsoft booth in the Expo hall and introduced myself to him. He’s often presenting or facilitating the MVP PGI’s we have (product group interaction sessions). I ran into him while walking in to the hall for the keynote and we had a good chat and ended up sitting next to each other for the session. Fawad’s official title is Principal Strategy and Operations Lead – Cloud & Enterprise at Microsoft, which currently is a lot around Dynamics 365 and the community around it. He has a couple of siblings in the Southwestern Ontario & GTA area so we talked a bit about that and then of course the Dynamics stuff we have in common. The keynote itself was headlined by James Phillips, Corporate Vice President, Business Applications Group at Microsoft. There was some introductions by Janet Lampert and Andy Hafer of Dynamic Communities to kick it off then James took the stage. I wasn’t quite sure where this keynote would go, as the recent history has not be great, from a Dynamics GP customer/partner point of view. The Microsoft keynote at the Tampa UG Summit 2 years ago was not well received by many at the time as Dynamics 365 was introduced. Today though I was pleasantly surprised. Of course, Dynamics GP only got mentioned once and it was an off-hand reference about customers that might not use one of the D365 cloud offerings, but hey, at this point, we’ll take it. We’re well used to not being in any “vision” presentations. It was a fairly innocuous comment but interesting. Everything seems to talk to everything else these days. Lots of every day things have some element of IoT (internet of things) elements to them, and it’s not going away. I don’t know if I have this quote verbatim, but it was close to that. This resonated with me as a process person, since so much of my role is focused on where we can make improvements with our business solutions and the processes around them. I’ve never thought of it specifically like he stated but it’s always in the back of my mind that what I work to improve today, by the time I may think I’m “done”, the time will be to revisit the first things I worked on to make further improvements. It truly is a continuous activity, not a destination. The demos of the keynote were focused mostly on Polaris, a company who underwent a transformation of their business to what appears to be quite the interconnected Dynamics 365 environment. For an SMB (small/medium business), the vision of what was presented just feels completely unattainable. The implementation of such a wide ranging solution seem like they must incredibly complex and costly. It’s interesting to see, but doesn’t bear a lot of resemblance to what seems possible at a smaller scale without significant investment. Another demo scenario later brought out Errol Schoenfish, familiar to those in the Dynamics GP community, but his presentation was around Business Central and an SMB customer demo. This one hit a little closer to home for what is likely the largest audience in the room, I would guess. After the keynote, the MVPs had an opportunity to meet James Phillips and engage in a private Q&A session with him. It was all under NDA so that’s all I can say about it. I must say I didn’t realize there were that many MVPs in attendance! We got together for a picture afterwards. I don’t know how many other MVPs were missing but there were at least 5 other GP MVPs who didn’t make the meeting or photo so that would mean there are at least 50 MVPs in attendance this week, most of whom are here presenting content. Impressive! My first session after the keynote and meeting was presented by MVP Ginger Grant. There were simply a ton of great tips around data modelling and loading of data to understand how and where things affect performance. There was a lot of talk about dates and date tables as well as handling relationships where there are multiple date fields in a single table (e.g. Invoice Date and Order Date). How Power BI stores data was also discussed and I had no idea it was done that way. The data is encrypted and as such all fields are aliased into numeric fields which is why there really is no performance impact from linking data types together that otherwise wouldn’t attempt in a relational database. This was fascinating and I have a lot more work to dig into wrapping my head around this. 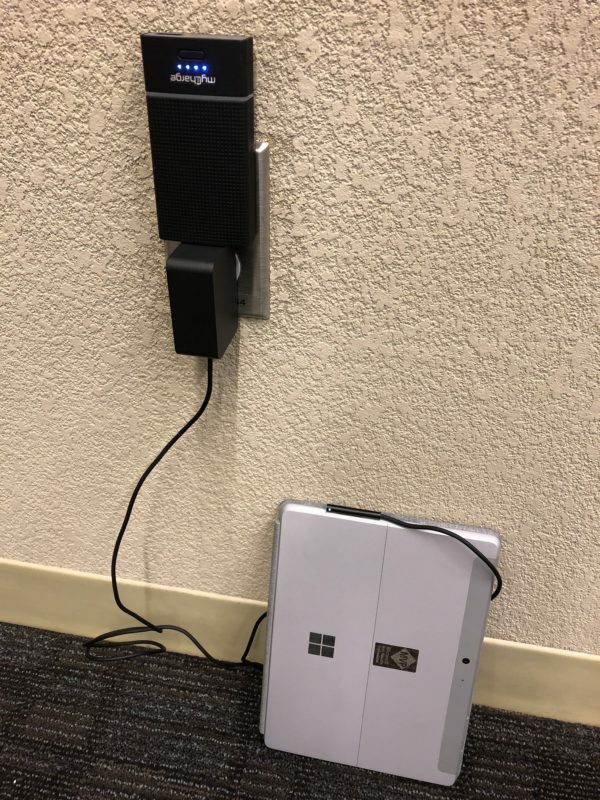 By the time this session started, my Surface Go battery was dead, my iPhone was < 30% battery and my backup portable charger was also dead. So, I sat in the farthest back corner in this presentation while my things charged and typed out notes into OneNote on my iPhone! Not ideal! The funny part is everywhere you walk in the convention center, there were people sitting on the floor near power outlets charging their things too. Life at a conference! This session was all about dates and nothing but! So much useful information but I need to play with things to wrap my head around all of it. Lots of tips around relative dates (Last X months), concepts like handling QTD, YTD data and rolling date reports. SO MANY DATES. The amount of formulas in DAX are staggering and the examples of what you can do… so much to learn! This presentation was back on the “GPUG” side of things and it was presented by fellow GP MVP John Lowther. It wasn’t quite what I was expecting from the session but there was some good information nonetheless. What I took out of it was more ideas around planning for a data warehouse and more ways to populate a DW than I had considered at first. There are definitely areas where we could leverage data warehousing to reduce the impact of some large reports on the application databases. The last session of the day was presented by Sunny Mattoon of Columbus. She walked through all aspects of Landed Cost in Purchase Order Processing, what it does, pros and cons of things etc. There were TONS of questions so I suspect this topic could be expanded to a longer session if they ever went longer than 1 hour sessions. We don’t have many scenarios where landed cost is of use but I wanted to sit in anyway to pick up some tips around the matching of those costs vs. the original PO receipts in case we decide to enable it some day. After the sessions were done, the day was done. 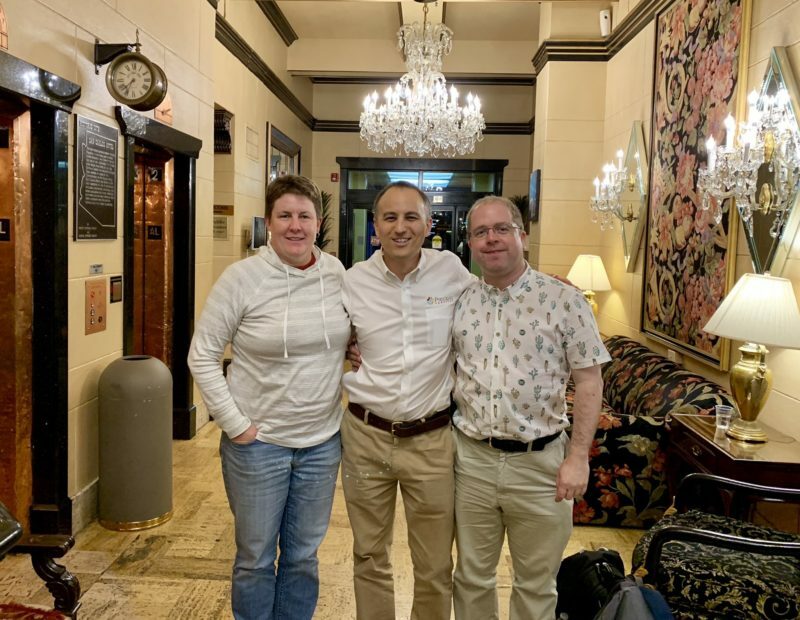 I met up with fellow MVP Steve Endow and UK friend Tim Wappat. We went out for a dinner at a great little Mexican restaurant a couple of blocks away from the convention center. We convinced someone to take our picture before we all departed (myself, Steve and Tim respectively). We don’t see Tim every year, so it was good to spend my last night here spending a bit more quality time with both him and Steve. The rest of the night was just spent writing this post, and packing up as I will be heading to the airport bright and early tomorrow morning! That’s it from me this year, unless something spectacular happens on my trip home tomorrow! Thanks Jen for posting. So sorry to hear about your father. Hope that he has a speedy recovery. Safe travels home.